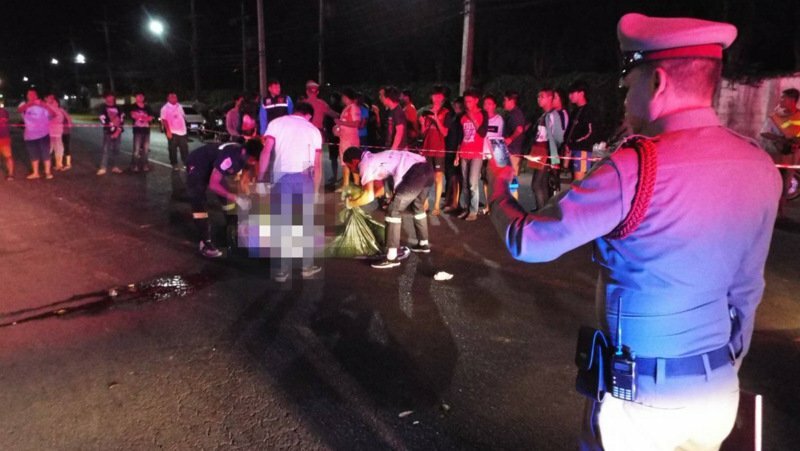 PHUKET: Police are investigating the slaying of a local councillor’s son in a street shooting near Saphan Hin early this morning (Jan 19). Officers from the Wichit Police were called to the scene, on Rattanakosin 200 Pi Rd, at about 3:30am. Capt Chatree Chuvichian and Capt Nikorn Somsuk, along with Wichit Police Deputy Chief Lt Col Pheeraphan Meemak, arrived at the scene to find the body of Theerasak Sae-Ong, 30, on the road. The Phuket native was dressed in a grey shirt with a yellow band and grey shorts. His body was lying beside his blue-white, Phuket-registered Yamaha M-Slaz motorbike with the key still in the ignition. Mr Theerasak had a bullet wound in his left temple and an exit wound on his right temple. Officers reported finding seven bullet casings on the ground. Police reported that from their initial investigations Mr Theerasak was driving from his house in Kathu. Witnesses saw a car pull up alongside Mr Theerasak and a conversation ensued. Then a person in the car pulled out a gun and opened fire. Witnesses were unable to give a description of the car or details of its licence plates, police noted in their report. Police at this stage presume the murder arose from a personal conflict. Officers will continue their investigation by continuing their questioning of witnesses and by checking CCTV footage in the area, they said. Police noted in their report that Mr Theerasak was the son of a councillor of Rassada Municipality.